Standard glass chairmat comes with flat polished edge and 2 inch radius corners free. 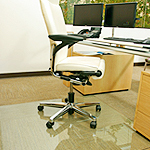 The affordable standard glass chairmat last a very long time and enhances the look of any office. All glass chair mats from chairmat.com ship for free in the lower 48 US.